Police have been attacked with petrol bombs as they tried to remove barricades from the railway line in Lurgan, County Armagh. A number of people gathered in the Bells Row area after a hijacked van was driven onto the line and set on fire earlier on Thursday. Police have now left the area and say they are talking to community representatives. The Antrim Road in the town is closed and the railway line is also shut. Four people are still being questioned about the discovery of components for the 250lb car bomb - found in the Antrim Road area - on Wednesday. The men, aged 22, 26, 36, and 46, are being held under the Terrorism Act. 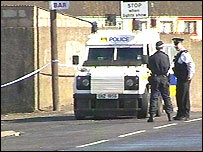 Police linked the find to dissident republican paramilitaries and said a bomb attack would have been imminent. Officers also came under attack from youths during Wednesday's security operation. Dissident republicans are opposed to the Northern Ireland peace process. They have been blamed for a number of attacks and attempted attacks on the security forces over recent years. # posted by SAOIRSE32 : 3:12 a.m.